This is a wonderfully creamy and very well known mascarpone based Italian dessert originating in the region of Veneto. It would be hard to call it a classic though as it has been invented relatively recently. 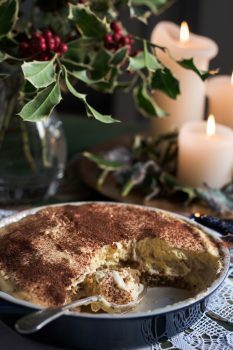 I like my tiramisù fairly creamy with only a hint of coffee and warming scent of alcohol running through it. There are so many versions of this pudding and different proportions of the ingredients, but here is the one that we enjoy the most. Don’t worry about lining everything perfectly in the dish. It is a rather messy dessert, but once all the ingredients land in the dish, it all comes together beautifully. In a bowl whisk for a few minutes the egg yolks with 50g of the sugar. Add the mascarpone and stir until well combined, make sure there are no lumps. Stir in the rum and Marsala. In the meantime whisk the egg yolks. Once they are firm and start to create soft peaks, gradually add the remaining sugar while whisking all the time. Fold the whisked egg whites into the mascarpone mixture. Dip the savoiardi biscuits into the coffee (they should become soft but not overly moist). Line the bottom of a dish with the biscuits (you can create two layers or just one, depending on the size of the dish, I like creating two layers), you can break the biscuits and fit them into small gaps if necessary. Spoon half of the mascarpone mixture on top of the biscuits, even out the surface and then add another layer of the biscuits (pre-soaked in the coffee). Now spread the remaining custard on top . Dust with the cocoa powder as the garnish and refrigerate for a minimum of an hour until you are ready to serve it.